Africa: Chad rides to the rescue in Nigeria, but which Chad? Chad rides to the rescue in Nigeria, but which Chad? ‘Our mission is to hunt down Boko Haram, and we have all the means to do that.’ These were the stirring words of Djerou Ibrahim, a colonel in the Chadian army, as he prepared to lead a 400-vehicle military convoy into Cameroon and north-eastern Nigeria. Cameroon’s government has welcomed the intervention (explicitly asking for assistance, in fact), while Nigeria’s has stayed relatively quiet – unwilling, perhaps, to admit the extent of the Boko Haram problem, and the government’s inability to deal with it alone. ‘Any support to our operations will be welcome, but it has to be properly channelled to key into our own ongoing operations, considering the fact that place is a territory of Nigeria,’ is all defence spokesman Chris Olukolade has said on the subject. Nigeria and, increasingly, Cameroon need the help. Since the beginning of the year, Boko Haram has continued to wage a devastatingly successful war in north-eastern Nigeria, where it is now in de facto control of territory the size of Belgium, and has been expanding operations into northern Cameroon. It has also been implicated in several brutal attacks this year: most notably the massacre in Baga, which left hundreds dead (some estimates suggest as many as 2 000), and the series of suicide bombings using teenage girls as probably unwitting bombers. Eventually, this external assistance is likely to take the form of a multinational force modelled on the African Union (AU) Mission in Somalia, which has enjoyed some success containing al-Shabaab. It will probably operate under an AU banner with funding from the European Union (as advocated by German Chancellor Angela Merkel). This kind of force takes a while to put together, however: only Chad is in a position to offer immediate back-up. Two things make this possible. First, Chad has solid legal grounds on which to send soldiers into Nigeria. In 1998, the Multinational Joint Task Force (MJTF) was established to combat banditry in the border regions between Chad, Niger and Nigeria, with each country contributing personnel. Over the years, the mandate of the MJTF has morphed into counter-terrorism, with Boko Haram its primary target. It can be argued that the proposed latest injection of Chadian troops into Nigeria – should President Goodluck Jonathan’s government accept the help – is simply a reinforcement of the MJTF, thus obviating the need for the inevitably lengthy negotiations over a new status of forces agreement. Second, Chad has the political will to make it happen – driven by self-interest, of course. Chad borders Nigeria’s problem areas, and is nervously watching Boko Haram’s expansion into Cameroon. If left unchecked, it is almost certain that Boko Haram will start taking a more active interest in Chad too. For Chadian President Idriss Déby, who has always dealt ruthlessly with any challenge to his power, this potential challenge must be nipped in the bud – especially given that he is already struggling to contain a rebel problem in southern Chad. ‘Chad’s motivation is largely self-interest; Déby doesn’t want an exacerbated rebel problem within Chad so it’s best to confront [Boko Haram] in Nigeria,’ says Roux. With those 400 military vehicles already rolling, it’s worth considering what kind of impact Chad’s intervention is likely to make. Fortunately, we have two very recent examples of how Chadian soldiers operate as peacekeepers; unfortunately, they tell two very different stories. In January 2013, Chadian soldiers were deployed to Mali to assist the French military intervention, and then later incorporated into the United Nations (UN) mission there. They played a leading role in chasing down the fleeing Islamist rebels, and were extremely effective in this role. ‘Chadian forces have succeeded in killing and capturing more than 100 jihadist militants and uprooting a network of weapons caches, fuel depots, and food stuffs hidden among the countless caves and grottoes that dot the landscape,’ wrote The Christian Science Monitor’s Peter Tinti in March 2013. 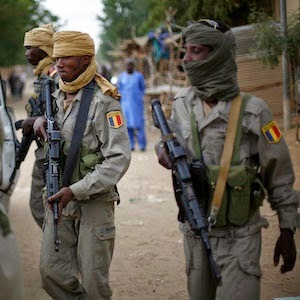 Analysts attributed Chad’s successes in Mali to its familiarity with the terrain and type of warfare, which was similar to what Chadian personnel would face at home. In 2013, Chadian soldiers were deployed to the Central African Republic (CAR) as part of a regional force that became an AU peacekeeping mission. This deployment was met with considerably less praise – quite the opposite, in fact. Not only were Chadian soldiers blamed for allowing the rebel Séléka movement to seize the capital unopposed, but they were also implicated in a series of nasty human rights violations aimed at opposition to the Séléka. In a report, the UN’s Office of the High Commissioner for Human Rights said that it had received credible reports of collusion between Chadian forces and the rebels, as well as testimony that men in Chadian military uniform had shot and killed civilians. Eventually, large public protests in the capital Bangui against Chad forced it to withdraw from the CAR – but not before Chadian troops had responded violently to those protests, killing at least 24. The question for Boko Haram and Nigeria is therefore: which Chad will turn up? The efficient, professional militant-hunters who did so well in Mali? Or the human-rights violators and rebel colluders who were so unpopular in the CAR? If it’s the former, Chad’s intervention might just succeed in putting Boko Haram on the back foot. If it’s the latter, however, then expect the situation to get even messier.